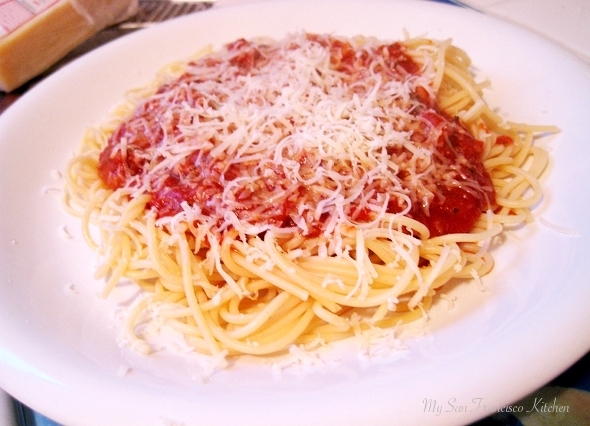 I finally got around to posting the spaghetti recipe from the other night that I made with yummy garlic bread. My mom gave me this recipe when I went off to college and it is one of the first things I made when I started cooking for myself. I still love this classic spaghetti recipe, especially because you can season it just the way you like with basil and oregano…yum! Crockpot recipes are the best because you can start them and leave them all day while you work, etc. This week flashed by me and so many things happened! I got an internship after searching for over a year (yay!) and school has been getting overwhelming because I can’t keep up with the pace this quarter. I just keep telling myself: it will all be ok! Tomorrow my family is coming to visit from LA, I am soo excited to see them 🙂 I am planning on making a German cherry streusel, so stay tuned. Brown meat on a heated skillet. Add onions and garlic and simmer for 7 minutes. Drain excess fat, then transfer to crock pot with remaining ingredients. Cook for 4 to 5 hours on low. Add ½ pound of spaghetti noodles and 1 tbsp olive oil and cook for time given on box (~9 minutes). Serve with fresh Parmesan cheese. This entry was posted in Dinner, Italian and tagged basil, oregano, parmesan cheese, pasta, spaghetti, tomatoes.